From time immemorial humans have been believing in the existence of God. In the primitive or prehistoric ages a number of gods and goddesses used to be worshipped. They were mainly symbolic of natural or supernatural powers. For example, in ancient Greece Zeus was the king of gods who possessed all powers of protection and annihilation. The Romans had their king of gods, Jupiter. There were also subordinate gods like Apollo, the sun god of the Greeks, and the like. These gods had their temples and shrines where they were worshipped and these were considered holy. Furthermore, the places where these shrines were situated were also considered holy spots and people used to visit these places to pay their respects to the gods. Natural elements like air, water and fire have intrinsic powers and the gods were personifications of these powers. Obviously, these gods had the power to protect or destroy. Therefore they had to be propitiated; else they might become angry and destroy people. This gave rise to the idea of worship of gods and goddesses, worship circumscribed within certain rites. This god-worship, again, gave rise to religion with one or more gods. Such religions were named monotheistic or polytheistic accordingly. Every religion has its scriptures, holy places, temples, churches, mosques, or symbols associated with God. Different religions have different ways of worship and certain places have come to be specifically associated with worship and adoration. Broadly speaking, places with such holy associations are known as tirthas (places of pilgrimage) to the people of the respective faiths. ‘The earth is being sustained by infinite truth, valiant righteousness, initiation, penance, prayer and sacrifice. May this earth, who is the mistress of our past and future, create a great universe for us.’1 When all these qualities are associated with a holy place, then it is called a tirtha. There is a difference between tirthas and other places of importance, be they historical, geographical, archaeological, or simply places of natural beauty. People visit the latter on excursions or pleasure trips. But pilgrimage is quite a different thing. Only journeys undertaken with some sacred or pious intention can be rightly called pilgrimage. The Sanskrit word tirtha is derived from the root verb tri, meaning ‘to cross’, ‘to surpass’. So according to the derived meaning, a tirtha is a place from where one can surpass or overcome one’s evil actions (tarati papadikam yasmat) or a place from which one can ascend (tarati yasmat sthanat) to a higher stage of life. A holy place raises us by leading to a higher mental plane; it has the power to manifest godliness in the human heart by making it pure. The ultimate Truth is the foundation of spiritual science. All scientific truths - even religions and philosophies - are but lower steps of the seemingly infinite flight of stairs that leads to the summit of spirituality. Pilgrimage also happens to be one such step. In English, one who goes on a pilgrimage is called a pilgrim. The word pilgrim is derived from Old French peligrin or from Late Latin pelegrinus, meaning ‘foreigner’. A pilgrim is ‘one who journeys in foreign lands’. So a place of pilgrimage is, by implication, a foreign land. But this differs greatly from the meaning conveyed by the word tirtha. Tirtha is a place for devotees, and devotees are not foreign to one another. For practicality’s sake, however, we must make do with the term place of pilgrimage for tirtha. ‘Know it for certain that whatever there is extraordinary, endowed with splendour or valour, that originates from but a spark of my divine brilliance.’4 As Sri Ramakrishna says, ‘The Sun’s light falls equally on all surfaces, but only bright surfaces like water, mirrors and polished metals, can reflect it fully.’5 Similarly, tirthas have the power to manifest the presence of God. For ages together great souls, spiritual luminaries, saints and sages have been visiting these places and undergoing spiritual practices there. Powerful spiritual vibrations surging out from their pure minds have produced strong spiritual fields that have made the places holy. In fact, these pure souls are the actual redeemers of the tirthas. It is their holy presence and spiritual fervour that transform these places into tirthas. ‘Tirthikurvanti tirthani, they make the tirthas holy’, says Narada.6 Holy Mother Sri Sarada Devi used to say: ‘Where else is God except very close to His devotees? If worldly people even visit the place used by holy men, the very atmosphere of the place can remove the dross of their mind.’7 Such places are found in abundance not only in India but all over the world. The entire land of India is, as it were, a place of pilgrimage. Swami Vivekananda called it holy land, punya bhumi. As observed earlier, people of all religious faiths have their places of pilgrimage. Muslims consider pilgrimage to Mecca one of their chief religious principles (hajj). Christians, Jews, Zoroastrians too have their holy places. Buddhists and Jains may not stress image worship and rituals, but even they have their sacred spots: to the Buddhists the places bearing the holy memories of Lord Buddha, where stupas or columns have been erected as monuments, are sacred, while the birthplaces of the twenty-four tirthankaras are sacred to the Jains. How have these tirthas come into existence? Where are they situated? What are the characteristics that make them holy or sacred? Tirthas are located everywhere - generally on river banks, mountaintops or in remote, inaccessible places. Many rivers like Ganga and Yamuna are regarded as holy. Innumerable pilgrim spots stand on their shores - right from the place of their origin down to where they meet the sea. Confluences of two or more rivers are called prayagas. Tirthas like Prayagraj at Allahabad, Sone Prayag, Vishnu Prayag and Rudra Prayag are examples of these. Puri, Dwarka and Kanyakumari are some of the famous tirthas that are situated on the seashore. But tirthas stand even in the midst of impassable deserts; Hinglaj is one such. The Himalaya, the greatest of mountains, is believed to be the abode of gods and goddesses. So the entire Himalayan range is one vast place of pilgrimage with its innumerable tirthas like Kailas, Mansarovar, Amarnath, Kedarnath, and Badrinath. We find a number of tirthas mentioned in the Vedas, Puranas and other scriptures. Places that have witnessed the birth and divine sports of incarnations of God and places chosen by saints and sages for their spiritual practice and ministration have become famous tirthas. Naimisharanya is one such eternally holy spot that has been described in many Puranas. Then there are the fifty-one shaktipithas dedicated to the Divine Mother, the embodiment of cosmic Energy. The story how the various parts of Sati’s body came to be associated with these pithas has been narrated elsewhere in this issue. Besides places like these, spots where famous ancient temples are located are also called tirthas. Thus Varanasi, Kanchipuram, Tirupati, Prabhas, Bhubaneswar, and Ujjain can all be equally designated as tirthas. It is evident that tirthas are primarily associated with religion. Each of them enshrines the spiritual culture and religious heritage of a particular faith or tradition. This is the reason why people at large feel passionately about them. In the Skanda Purana, Agastya says to his wife Lopamudra: ‘Tirtha shabda vararohe dharma­krityeshu vartate; O fair one! 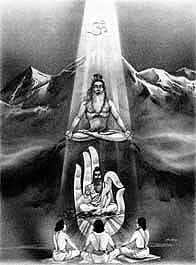 The word tirtha is related to religious observances.’8 Agastya further describes other implications of tirtha to Lopa­mudra: ‘O fair one! Mother is a tirtha, father is a tirtha, congregations of holy persons are tirthas, religious thinking as well as spiritual principles (yama) and disciplines (niyama) are tirthas, sacred discourses by the celestial sages (devarshis), places which great ascetics and gods frequent, and holy lands, O my beloved, are all considered tirthas’ (6.108.12-4). ‘The assumption of forms by Brahman, the pure Consciousness, the One without a second, partless and bodiless, is for the sake of fulfilling the purposes of the worshippers.’9 The Lord is also called bhavagrahi, one who takes into account the inmost attitude of the devotee. That inmost attitude, imbued with the utmost unalloyed love, is the final word in the sphere of genuine religion, though outwardly a devotee may worship God with offerings or through charity or by singing of praises and glories. Pilgrimage too is but a kind of worship of God in the form of a holy tirtha. Every tirtha has its presiding deity who must be paid reverential homage, be it in the form of worship, chanting of holy names or meditation. That apart, in a tirtha one is enjoined to give in charity to holy persons as well as to the poor and the afflicted. This is the manner in which the Divine in the form of a tirtha is worshipped. God in turn is pleased to gratify the pilgrim with the desired results. Yamas are the lofty ethical principles of life. They are termed ‘universal’, because they comprise spiritual imperatives which are valid irrespective of time, place, social purpose or cultural demands. They consist of the five great vows of non-killing (ahimsa), truthfulness (satya), non­stealing (asteya), continence (brahmacarya), and non-receiving of gifts (aparigraha). In order to be established in these ethical principles, five observances or disciplines have been prescribed. They are: internal and external purification (shauca), contentment (santosha), mortification or penance (tapas), study (svadhyaya), and worship of God (ishvara­pranidhana). These are called niyamas. How great these souls are! They possess the power of purifying anything that comes in contact with them. The Lord Himself confesses to Uddhava: ‘I always follow him who desires nothing, who is a muni (deeply engrossed in God), serene, free from enmity and who looks upon all with an equal eye, in order that all (the worlds within Me) may be purified by the dust of his holy feet’ (11.14.16). Such are the great devotees of God! They possess infinite purity, and the capacity to purify everything. Teshveva hi virago’sya nairmalyam samudahritam. A person having such a mind has no need to go anywhere to purify himself; his own pure mind is a place of pilgrimage. Not only that, whoever comes into contact with him becomes pure regardless of whether words are exchanged or not. This is beautifully described in the Dakshina­murti Stotra: ‘How strange! Under the banyan tree is seated a young guru, surrounded by old disciples; the guru’s mute eloquence dispels all doubts of the disciples!’ What is the secret behind this? The guru’s mental field is so vast and powerful that it attracts and merges into itself the disciples’ small mental fields. Where then is the room for any doubt? Such a mind, devoid of the least stain of desire, the cause of impurity, is a much more effective purifying agent than a place of pilgrimage. A pure mind is a storehouse of immense power, including that of purifying other impure minds. So the truest and best pilgrimage is to purify the mind (manasah vishuddhi) - that is the greatest tirtha - because it gives rise to a number of divine qualities that are themselves considered great tirthas: truthfulness (satya), forgiveness (kshama), sense control (indriya­nigraha), compassion (sarvabhuta-daya), uprightness (arjava), charity (dana), self-control (dama), contentment (santosha), continence (brahmacarya), pleasant speech (priyavadita), knowledge (jnana), fortitude (dhriti) and austerity (tapas). All these are tirthas in themselves (6.32); they are called ‘divine treasures’. A heart that possesses these rich treasures is ‘God’s parlour’; God manifests therein. And wherever such a person goes, that place becomes a tirtha. Tatra tasya kurukshetram naimisham pushkarani ca. ‘Wherever a man may live having controlled the senses, for him that place turns into the tirthas of Kurukshetra, Naimisha and Push­kara’ (6.40). There lived a poor brahmin with his wife, daughter and son. Though the family was poor they were very pious. They lived on alms and could hardly make both ends meet. Once it so happened that they did not get any alms and so had to starve for a couple of days. Death was knocking at the door. Then, with much trouble, the brahmin managed to procure a meal of wheat. It was first offered to God and then divided into four equal parts. They were about to eat the meal, when a hungry guest arrived. He too was starving. A guest is to be regarded as Narayana Himself, so the brahmin offered his share to the guest, who ate it and said, ‘Bring more food. This small quantity has only increased my hunger!’ Now the wife offered her share to him. The guest consumed it in no time and demanded more. The son thought: ‘It is my filial duty as a son to complete the sacrifice undertaken by my father. Let me offer my share also to the venerable guest.’ The guest devoured that too and said, ‘My hunger is not yet satiated; I want some more food.’ Then the daughter thought: ‘As a daughter, is it not my duty to fulfil my parents’ sacrifice?’ And she placed her share before the guest. The guest’s fiery hunger was now satisfied and he blessed them all and went away. Thus the four people gave up their lives for the sake of the guest. A mongoose was there witnessing everything. It came out and rolled on the sacred leftovers - and instantly half of its body became golden! ‘Where on earth can I find another great tirtha like this?’ It began searching for such a place in order to turn the other half of its body golden. During its long search it came to the place where Yudhishthira had just completed his rajasuya yajna, the greatest sacrifice performed by a paramount ruler of the entire earth, and rolled on the spot - but with no effect! Another incident would not be out of context here. Once a very poor devotee had a strong desire to go to Varanasi to have the darshan of Lord Vishwanatha. But he was too poor to do so. Swami Adbhutananda, a direct disciple of Sri Ramakrishna, was then living in Varanasi. He came to know of the devotee’s earnest longing and wrote to him to somehow collect the one-way railway fare to Varanasi and that other things could be taken care of. Thus being assured, the devotee reached Varanasi with great difficulty and had the darshan of Lord Vishwanatha and Mother Annapurna, and enjoyed the holy company of Latu Maharaj. But one day, at the Vishwanatha temple, he felt great mental anguish. After bathing in the Ganga and finishing his worship of Shiva with bel leaves, when he came out of the temple he saw that all the devotees were giving alms to mendicants and beggars according to their ability. He alone lacked the capacity to give in charity. He cried fie upon himself: ‘I am a poor, wretched beggar myself, deprived of this rare opportunity. On the contrary, having come to this holy place I am enjoying food and shelter provided by sadhus, and I do not have a penny to pay for it!’ He returned to his room with a heavy heart, closed the door and started shedding tears of grief. Latu Maharaj came to know everything and suggested: ‘What does it matter? You do one thing: tomorrow after bathing in the Ganga offer a handful of it to God and pray, “May all the miseries of the world be dispelled.”’ The devotee thought, ‘This is just a consolation for a helpless destitute like me. What merit can be derived from it?’ However, the next day the devotee did exactly as he was advised simply to honour the words of a great soul like Latu Maharaj. Immediately his mind became calm and serene, his heart was filled with an unspeakable bliss, and he felt blessed with divine grace. This is the result of true pilgrimage. Human civilization is vast and infinitely diverse, and the different tirthas are places of holy communion for the whole of humankind. There we experience the idea of unity in diversity, a sense of oneness; there we feel ourselves as part and parcel of the Cosmic Being, Virat, for the tirthas are eternal altars for divine communion. Pilgrimage helps us break free from the narrow, limited bounds of selfishness, caste, creed, and nationality and become one with the entire humankind. God is all and is in all. The one Eternal Being has become many, assuming innumerable forms and innumerable names. Realization of this truth is the culmination of spirituality - avagatih paryavasanam, everything terminates in knowledge. It is this knowledge of oneness, where the entire universe becomes one single home, that a genuine devotee, whose heart has become pure and saturated with the nectar of universal love, realizes at a tirtha. This is the highest significance of pilgrimage. Else, as Sri Ramakri­shna said, ‘A sannyasi’s kamandalu, made of bitter gourd, travels with him to the four great places of pilgrimage but still does not lose its bitterness.’ (21) Floating in the vast ocean of human souls we must transcend the artificial barriers that distinguish between Hindus, Muslims, Christians and so forth. We are all devotees of one and the same God. In the words of Sri Ramakrishna, ‘devotees have no caste’; they are the blessed children of Eternal Bliss, amritasya putrah! Realization of this truth is the real purpose of pilgrimage. Om tat sat. 2. Krishna Yajur Veda, 16.42. 5. Swami Brahmananda, Words of the Master (Calcutta: Udbodhan Office, 1938), 19. 7. Her Devotee-Children, The Gospel of the Holy Mother (Chennai: Ramakrishna Math, 2000), 265. 10. M, The Gospel of Sri Ramakrishna, trans. Swami Nikhilananda (Chennai: Ramakrishna Math, 2002), 87. 12. ‘Kashi Khanda’, 6.38, in Skanda Purana.